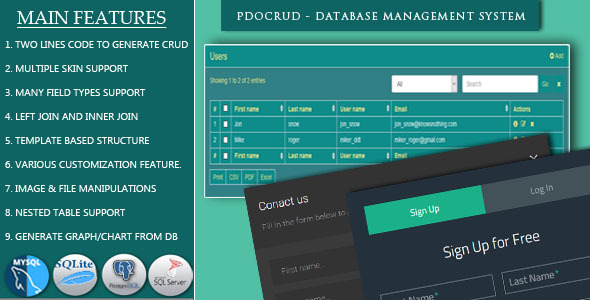 PDOCrud is an advance PHP based CRUD application. It supports Mysql, Pgsql and Sqlite database. You can use PDOCrud to generate both frontend and backend of your application. By writing just 2-3 lines of code only, you can performs insert/update/delete and select operation. You just to need to create object and call for render function for that table and everything will be generated automatically. Form fields will be generated based on the data type. You can remove fields, change type of fields and can do various types of customization.